Asperger's disorder A pervasive developmental disorder in which a child maintains adequate cognitive and language development but becomes severely impaired in social interaction. Children with this disorder also develop restricted, repetitive, and stereotyped patterns of behavior, interests, and activities. Attention-deficit/hyperactivity disorder (ADHD) A behavior disorder involving problems with inattentiveness, hyperactivity, and impulsivity. Autistic Disorder A pervasive developmental disorder involving massive impairment in an individual's ability to communicate and relate emotionally to others. Childhood disintegrative disorder A pervasive developmental disorder in which the child develops normally for the first 2 years and then starts to lose language, social, and motor skills, as well as other adaptive functions, including bowel and bladder control. Communication disorders Conditions involving impaired expression or understanding of language. Conduct disorder A development-related disorder that involves repeated violations of the rights of others and society's norms and laws; the childhood precursor of antisocial personality disorder in adulthood. Coprolalia The involuntary uttering of obscenities. Developmental coordination disorder A condition characterized by marked impairment in the development of motor coordination. Down syndrome A form of mental retardation caused by abnormal chromosomal formation during conception. Dyslexia A learning disorder in which the individual omits, distorts, or substitutes words when reading and reads in a slow, halting fashion. Echolalia Repetition of words or phrases in the speech of a person with autistic disorder. Encopresis An elimination disorder in which the child is incontinent of feces and has bowel movements either in clothes or in another inappropriate place. Enuresis An elimination disorder in which the child is incontinent of urine and urinates in clothes or in bed after the age when the child is expected to be continent. Expressive language disorder A communication disorder characterized by having a limited and faulty vocabulary, speaking in short sentences with simplified grammatical structures, omitting critical words or phrases, or putting words together in peculiar order. Failure to thrive A condition in which the child does not grow physically and cognitively at a normal rate due to poor prenatal care or grossly inadequate and inattentive parenting. Feeding disorder of infancy or early childhood A disorder involving the persistent failure to eat, leading to a loss of weight or failure to gain weight. Fetal alcohol syndrome (FAS) A condition associated with mental retardation in a child whose mother consumed large amounts of alcohol on a regular basis while pregnant. Hyperactivity A motor pattern involving abnormally energized physical activity, often characterized by quick movements and fast talking. In children, behavior characterized by fidgeting, restlessness, running about inappropriately, talking excessively, and feeling incapable of playing quietly. Impulsivity Inability to control oneself, expressed in behaviors such as blurting out answers to questions, having difficulty waiting one's turn, and interrupting other people. Learning disorder A delay or deficit in an academic skill that is evident when an individual's achievement on standardized tests is substantially below what would be expected for others of comparable age, education, and level of intelligence. Mainstreaming A governmental policy to integrate fully into society people with cognitive and physical disabilities. Mathematics disorder A learning disorder in which the individual has difficulty with mathematical tasks and concepts. Mental retardation A condition, present from childhood, characterized by significantly below-average general intellectual functioning (an IQ of 70 or below). Mixed receptive-expressive language disorder A communication disorder in which the individual has difficulty understanding and expressing certain kinds of words or phrases, such as directions, or, in more severe forms, basic vocabulary or entire sentences. Oppositional defiant disorder A disruptive behavior disorder of childhood that is characterized by undue hostility, stubbornness, strong temper, belligerence, spitefulness, and self-righteousness. Pervasive developmental disorders Conditions that begin in childhood and have a major impact on social and cognitive functioning; involving serious deficits in social interaction and communication skills, as well as odd behavior, interests, and activities. Phonological disorder A communication disorder in which the individual misarticulates, substitutes, or omits speech sounds. Pica A condition in which a person eats inedible substances, such as dirt or feces; commonly associated with mental retardation. Reactive attachment disorder of infancy or childhood A disorder involving a severe disturbance in the ability to relate to others in which the individual is unresponsive to people, is apathetic, and prefers to be alone rather than to interact with friends or family. Reading disorder A learning disorder in which the individual omits, distorts, or substitutes words when reading and reads in a slow and halting fashion. Rett's disorder A pervasive developmental disorder, occurring only in females, in which the child develops normally until between 5 months and 4 years of age and then begins to show a number of neurological and cognitive impairments, including a deceleration of head growth, stereotyped movements of the hand, a lack of bodily coordination, language impairments, and social withdrawal. Rumination disorder An eating disorder in which the infant or child regurgitates food after it has been swallowed and then either spits it out or reswallows it. Selective mutism A disorder originating in childhood in which the individual consciously refuses to talk, sometimes accompanying this refusal by oppositional or avoidant behavior. Separation anxiety disorder A childhood disorder characterized by intense and inappropriate anxiety, lasting at least 4 weeks, concerning separation from home or caregivers. Stereotypic movement disorder A disorder in which the individual voluntarily repeats nonfunctional behaviors, such as rocking or headbanging, that can be damaging to his or her physical well-being. 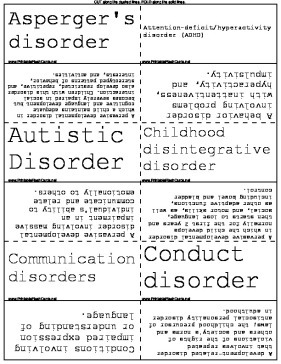 Stuttering A communication disorder that involves a disturbance in the normal fluency and patterning of speech that is characterized by such verbalizations as sound repetitions or prolongations, broken words, the blocking out of sounds, word substitutions to avoid problematic words, or words expressed with an excess of tension. Tic A rapid, recurring, involuntary movement or vocalization. Tourette's disorder A tic disorder involving a combination of chronic movement and vocal tics.